As the final arc of Transformers: Lost Light begins, James Roberts is beginning to tie up even more loose ends and close out his grand Transformers epic. 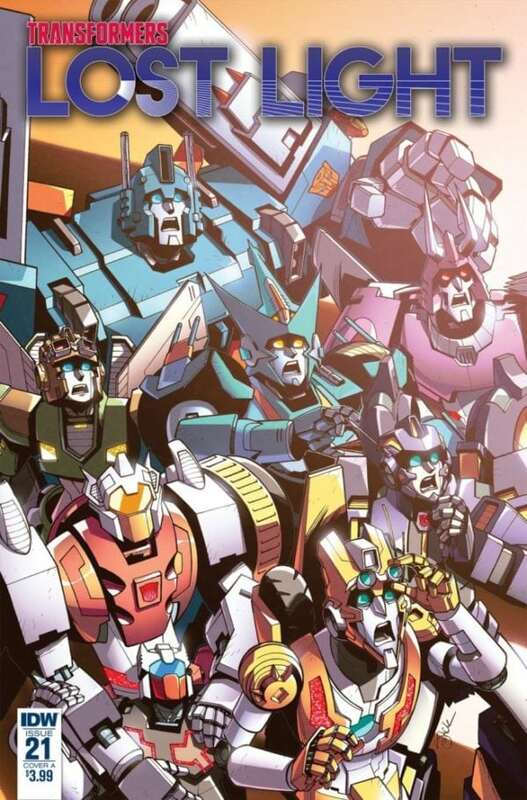 He sets the stage for a nice finale in this issue as things come full circle to the start of Lost Light and some of the bigger mysteries the crew has come across along their journey. Lost Light #21 is a nice issue that builds off the long history of the series and Roberts uses that to his advantage for their last adventure. Picking up where the previous issue left off, Rodimus and his crew aren’t even done dealing with Getaway’s defeat when a rip in the galaxy opens up and they are left at the mercy of the mysterious Grand Architect. Some of the bigger questions surrounding this character and a couple other galactic groups are answered, but where Roberts succeeds in this issue is by emphasizing how much of a family they’ve become, from Rodimus immediately forgiving the mutineers to his call that they should all stay together and be included in meeting the Grand Architect by listing everything (and I mean everything) they’ve gone through on their journey. The humour hits all the right notes too. It sounds like a broken record at this point, but Roberts does such a great job of balancing the serious and funny tones in his Transformers stories and this is no exception. From the way Ultra Magnus recalls a former partner and his tendency to exaggerate or Rodimus realizing they are standing, in fact, in a gigantic cell or Rung literally making the transformation sound, all the humourous moments are all worth a laugh. The partnership between the Lost Light and the Scavengers also provides several funny moments that its enough to look back on the series and realize the lost potential by bringing these two drastically different teams together only at the very end. The story moves along at a nice pace despite some of the exposition. Roberts is able to convey the scope of the Grand Architects plans and what he’s after in a fairly clear manner that doesn’t make the issue feel bogged down. He’s also able to again mix in the issue’s humour into the exposition and makes it flow naturally. The various story threads are also brought together in a way that doesn’t overstuff the issue and loses readers with its information and massive cast. There is also a couple nice dodges with the identity of the Grand Architect, though there’s probably still more at play over who he is than the brief image we’re shown while longtime fans will be very excited at one character’s return on the final page. Jack Lawrence’s art again shines throughout. With such a large amount of transformers appearing on the pages, sometimes even multiple in a single panel, Lawrence makes each once look and stand distinctly from the other and does a good job at their facial expressions. Joana Lafuetne’s colours compliment Lawrence’s illustrations as she gives a nice variety of colours to the characters and surroundings, making good use of the shadows in scenes wit the Grand Architect. Transformers: Lost Light #21 is as good a stage setter as you could expect for the series’ final arc. All the various stories and mysteries are coming together fairly nicely without barraging readers with too much information. Roberts handles the story, reveals and character interactions well while Lawrence illustrates the bots very well. It’s definitely going to be bittersweet now that we’re in the final chapter of the series.